Imagine you’ve just settled in to watch the latest episode of your favorite show, when you notice you’re a tad chilly. Just as you’re about to grab a blanket from across the room, your thermostat kicks in—almost like it knew. 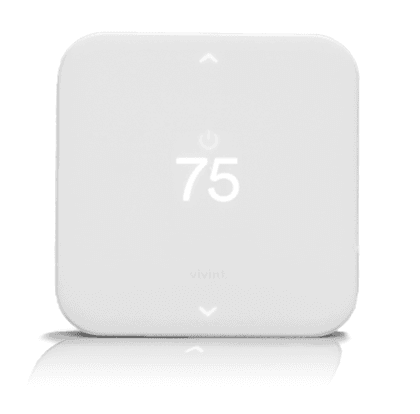 Meet the Vivint Element Thermostat, a programmable thermostat designed to study your daily habits and adjust the temperature to your routine. Do you tend to turn up the heat on weeknights while catching up on Game of Thrones, or cool it down by five degrees when you go to sleep? The Element takes notice. Within a few days of installation, the Element will create a personalized schedule that provides automatic climate control for your home. Intelligent technology records your preferences and offers settings for home, away, sleep, or vacation, for increased energy savings. 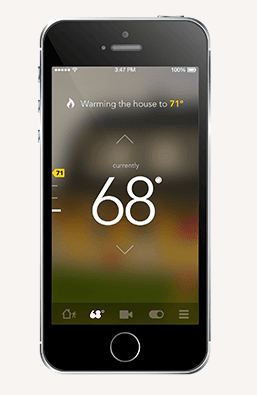 Control your digital thermostat online or from the Vivint Sky™ smartphone app, and set up notifications to adjust the temperature as needed. Features a sleek, barely-there display, which can light up on approach or with the touch of a button—it’s your choice. Combining temperature control with home automation, the Element is specifically designed to work seamlessly with Vivint SkyControl™ apps & devices. Add Vivint Element to any new package for $169.99. Sync your Vivint Element with Amazon Echo’s Alexa for a completely hands-free, voice-controlled thermostat. Cooking up a feast in the kitchen and need to turn on the AC to balance out the oven? No need to wash your hands first. Simply ask Alexa to adjust the temperature, and cool air is on its way. Vivint Flex Pay makes it easier than ever to afford a smart home. You’ll have the option to pay off your security or home automation equipment—like the Vivint Element Thermostat—upfront without a contract or slowly over a period of time. That means you can enjoy a new wireless programmable thermostat right away no matter what your financial situation.